Dans les 25 minutes qui suivent la sortie de la CDB, vous pouvez vous asseoir sur la véranda de Bach, contemplant le magnifique détroit sauvage de Cook avec seulement vous, les phoques et les goélands. Le bach est situé sur la côte sud dans une baie entièrement isolée, nichée au pied d’une plantation d’arbres de Karaka. Exellent plongée et pêche, promenez-vous le long du rivage ou admirez la vue depuis les traces de la ferme au-dessus de la baie. Le Bach est totalement hors réseau, il dispose d'un éclairage solaire, de gaz pour la cuisine et d'eau chaude, il n'y a pas de réfrigérateur, alors apportez de la glace pour la corbeille. Le Bach a une vue magnifique, un ciel nocturne époustouflant et une abondance d’air frais, emportez donc une veste! SI VOUS AVEZ BESOIN D'UN PLUS GRAND BACH, VEUILLEZ CONSULTER NOTRE AUTRE LISTE - HUNTER BAY BACH. Il faut 4 roues motrices pour se rendre au bach, mais cela varie en fonction du temps et des conditions de la route. So close to the city but so removed. Possibly the best stars I’ve watched. The Bach has games and books and a stunning view of the South Island. Crystal clear water. We felt very welcome and had everything we might need. Very relaxing place. Thank you! My wife and I stayed two nights in the Bach and loved every minute of our stay. The breath-taking views along the coast is something that will be etched in our minds for along time. Wonderful facilities and well presented Bach with many home comforts considering it has no mains power, but is made up for it by a good hot water system and lighting. Well recommended for a weekend getaway and definitely would consider staying again. The views are truly breathtaking. The bach warm & cosy because it’s so small. Loved it! Chrissy the host gives great instructions. Cute wee bach in a very private part of the world. Wow! This place is truely amazing! I couldn’t fault. It has everything you need and the location is unveliably beautiful! 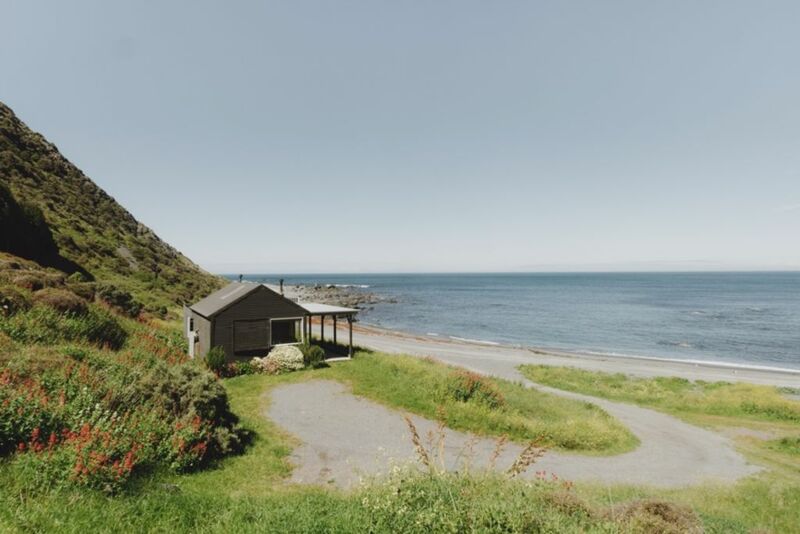 My husband and I loved our weekend stay at this little whare. It was a perfect way to get time-out from the routine of normal life, and rest. The bach has a 2-element gas stove and bbq (no oven) and is fully equipped with everything we needed. We particularly enjoyed drinking tea from a fabulous tea pot (the best!) and china teacups. We had read other comments about the traffic along the beach before booking which was helpful, because it prepared us for that. Yes there is a bit of to-ing and fro-ing from others staying/living at the bay. But there were some blocks of time where it was completely quiet. Thank you Chrissy and family.